Photographs by Daido Moriyama. Edited by Mark Holborn. Thames & Hudson, London, United Kingdom, 2017. In English. 424 pp., 180 black-and-white and 50 color illustrations, 8¼x11". Inspired by Japanese photographers, as well as by William Klein’s seminal photography book on New York, Daido Moriyama moved from Osaka to Tokyo in the early sixties to become a photographer. He became the leading exponent of a fierce new photographic style that corresponded perfectly to the abrasive and intense climate of Tokyo during a period of great social upheaval. Between June 1972 and July 1973 Moriyama produced his own magazine publication, Kiroku, which was then referred to as Record. It became a diaristic journal of his work as it developed. Ten years ago, after a decades-long interval, he was able to resume publication of Record. 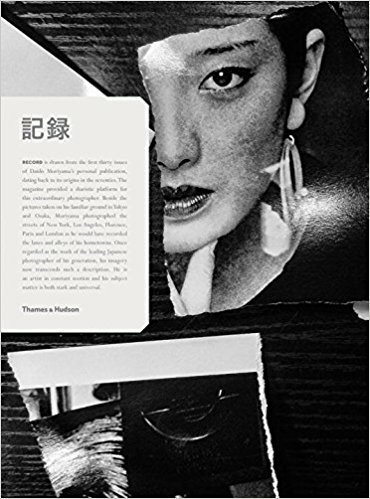 Now this book collects work from all thirty published issues, edited into a single sequence, punctuated by Moriyama’s own text as it appeared in the magazine. Produced at the magazine’s original size, with an introduction by Mark Holborn, this volume features more than 200 works from throughout the magazine’s history. It used to be assumed that Moriyama’s peculiarly Japanese style was tied to his Tokyo roots. The evidence of the last ten years demonstrates that Moriyama, a restless world traveler, has been able to apply his unique vision to northern Europe; southern France; the cities of Florence, London, Barcelona, Taipei, Hong Kong, New York, and Los Angeles as well as the alleys of Osaka; the landscape of Hokkaido; and Afghanistan. To view the Japanese Edition click here. PLEASE NOTE: The English Edition of Record will not be signed.